The Sodom Event: Let's step beyond the Bible perspective for a moment, and consider larger contexts as evidence. 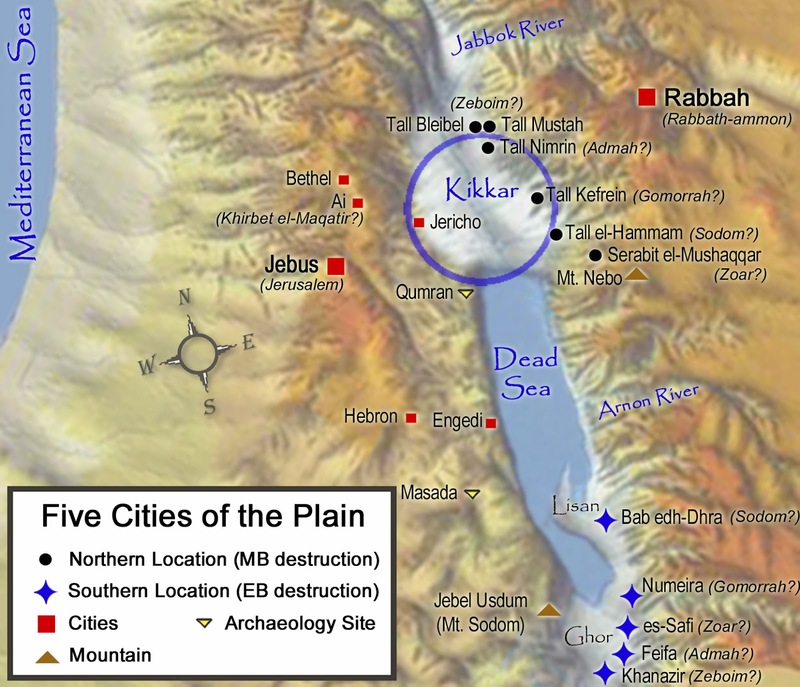 First, has the terminal destruction layer been similarly dated at other sites between Kings Road and the Dead Sea in the wadis and plains between the Jabbok and Arnon? Tall al-Kafrayn has been excavated 2000-2009 by Thanasis J. Papadopoulos. "Destruction of the settlement by fire during the transitional period LBA/Early Iron Age." End of MB period like Tall el-Hammam - Τhanasis J. Papadopoulos, “The Hellenic Archaeology Project of the University of Ioannina in Jordan: A Preliminary Synthesis of the Excavation Results at Ghawr as-Sāfī and Tall Al-Kafrayn (2000-2004),” in Studies in the History and Archaeology of Jordan, ed. Fawwaz al-Khraysheh, IX (Amman: Department of Antiquities, 2007), 189. Tall Nimrin excavated in 1989-90, 93, 95 by James Flanagan and David McCreery. MB II in Stratum II but no LB occupation. - James W. Flanagan, David W. McCreery, and Khair N. Yassine, “Tell Nimrin: Preliminary Report on the 1993 Season,” ADAJ 38 (1994): 217-18.- Steven Falconer, “The Middle Bronze Age,” in Jordan: An Archaeological Reader, ed. Russell B. Adams (London, U.K.: Equinox, 2008), 268. Tall Bleibel and Tall el Mustah have never been excavated but there have been surface surveys by Nelson Glueck (1051) and Ibrahim, Yssine and Sauer (1975-76) and Change Ho and lee (2000). They report MB but no LB or IA I pottery. Khouri reports that when a road cut through the site there was remains of ancient walls and house foundations, burning and much pottery. These sites all have the same occupational footprint as Tall el-Hammam.